As the writer's strike in Hollywood drags on, a blog has been created to give them an outlet. The blog Why We Write consists of a series of essays by prominent, and not so prominent, TV and Film writers and by everyday people who hope to someday call themselves writers. Each day an essay from a different writer is posted, in which they talk about their reasons for writing. I especially enjoyed reading the essay from LOST writer, Damon Lindeloff and the essay from Scrubs creator, Bill Lawrence. (If you do click over to read their essays, be warned, they do drop a couple of expletives.) Reading their essays got me to thinking about why I myself write. I don't know if I've ever stopped to think about that before. Writing was just something I've always done. I think writing, first and foremost, is an outlet for my imagination. All those creative crazy thoughts have to have somewhere to go! I've always made up stories ever since I was a little kid. I have notebooks and binders from my childhood years just filled to the margins with my silly stories and my own handcrafted fairy tales. There were all these amazing adventures and interesting characters in my head and I felt compelled to capture them on paper before they flittered away into the mist. I think another reason why I write, is to connect with other people through storytelling; to share a thought, an experience or to touch someone with an emotion. Whenever my father told me stories from his childhood, or would make up stories for me (complete with sound effects), it was such a magical moment between us; a connection point. When it comes to this blog, I write in order to connect with friends (and the occasional stranger) over shared interests. It's fine to talk about creativity, the imagination, or connecting with other people. Those are all fine and good reasons for writing. However, if I'm going to get real and take a hard look at myself as an artist, I think a big reason why I write my fiction pieces is out of cowardice. Through my characters, I can do things I would never have the courage to do in real life. In my stories, I can give the meek girl courage and the perfect words to stand up to the bully. I can give my characters the power and ability to be the heroes I could only hope to be. I can have a character admit their true feelings towards someone else. They can be brave enough to leave home and set out on new adventures. I can live vicariously though them, and maybe...sometimes...they help me to find a little bit of courage in my life too. Writing is funny that way. But lastly, and perhaps most importantly, I write because it is a talent God has blessed me with and when I write, I feel a connection to Him. In the movie Chariots of Fire, olympic runner Eric Liddell is trying to explain to his sister why he would rather race than enter the missionary field, and why running is just as noble a pursuit. He says, "I believe God made me for a purpose, but he also made me fast. And when I run I feel His pleasure." When I'm creating, I feel a connection to my Creator. The joy I feel, when crafting a beautiful phrase, using the gifts God has given me, is in some small way, an act of worship. I am doing one of the things God has created and enabled me to do. I hope it makes Him smile. Once upon a time, there was a little girl named D. She fell in love with a couple of books by Lewis Carroll called "Alice's Adventures in Wonderland" and "Through the Looking Glass and What Alice Found There." These stories didn't play by the rules. They were wild, creative unbridled fun in an imaginary land with a cast of crazy characters and a witty young girl who could hold her own amongst them. It opened up D's idea of literature and storytelling. The possibilities were endless. She would never be the same. As D grew up, her obsession also grew. She rode the Alice in Wonderland ride and the Mad Hatter's Teacups in Disneyland a dozen times. She collected Alice dolls. She re-read the books. She memorized the poems. There was something about Wonderland that kept drawing her back. 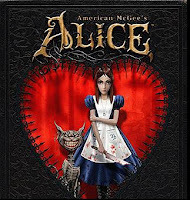 One day, a game designer named American McGee created a game called "Alice". It took the Wonderland world and characters to a whole new level. Now Alice was a distraught teenager in a mental asylum and her struggle through Wonderland was a struggle not to find the white rabbit or her way home, but to find her sanity. D loved this game and its re-imagining of the Wonderland world. She squealed with glee and played it for hours. She even dressed up as this version of Alice for a costume party and forced her poor, loving, obliging husband to dress up as the Cheshire Cat. Now D is all grown up, but she still visits Wonderland. When she reads the stories, she feels like a child again and her heart sings with all the imagination and magic and witty fun. Her obsession is still so very much alive, that she created a website (still under construction) with a Wonderland theme, as well as a related blog (Storm in a Teacup - get it?). So yesterday, when her dear friend Raven (also a co-owner of the Wonderland website and someone just as obsessed with Wonderland) e-mailed her this article, D could hardly contain her excitement. Her favorite director, Tim Burton, was going to do a film based on Alice, some of her favorite stories! This film is set for a 2010 release, so the wait will be long. 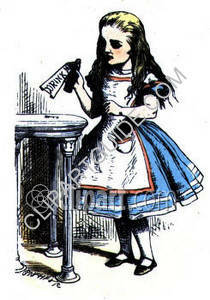 However, a film based on the "Alice" video game is currently in production and set for a July 2008 release. Although, in a horrible casting decision, the plucky British teenage Alice with attitude is being played by...Sarah Michelle Gellar. Sigh. If only Tim Burton was doing both versions... Either way, and regardless of any misguided casting, D will be first in line at the theater for both shows, ready to take another magical trip into Wonderland. Will you come follow her down the rabbit's hole...?